The Discount Fly Fishing Blog is our mini-journal of all things fly fishing. •	lets you know whenever any new Web pages appear on Fly Fishing Discounters.com, telling you about a new and/or unique piece of gear, an item with a special discount, a new fly fishing travel adventure, etc. •	lets you know when I send out the Fly Fishing Discounters.com e-zine (in case you don't like to give your e-mail address, or if your ISP tends to over-filter causing you to miss an issue). To subscribe to my Discount Fly Fishing blog (no e-mail necessary), right-click on the orange RSS button (see bottom buttons to the left) and then paste the URL into your RSS reader. Or click on the My Yahoo! button or My MSN or Add To Google button if you keep a personalized home page there. Enjoy... the fun is about to begin! Continue reading "The One That Didn't get away"
We have scoured the globe for unique and unusual fly fishing vacations to write about. Join our blog to keep up with us as we update often. 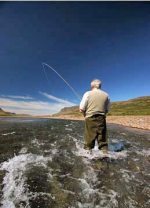 Continue reading "FLY FISHING VACATIONS - Unique and Unusual Destinations"
Continue reading "Tony's big one"
We DISCOUNT fly fishing gear AS THE RULE. All fly fishermen whether healthy or disabled should enjoy the fishing experience without experiencing the monetary pain. Do you Catch & Release? Continue reading "DISCOUNT FLY FISHING GEAR, FLY FISHING NETS, STREAMSIDE ACCES., FLY TYING VISES "
Continue reading "We are hungry"
Continue reading "I think it's a state record crappie...... "
Continue reading "The Catch And Release Of A Real Monster"
Continue reading "Where can I find it at Restaurant"
Continue reading ""THE ONE THAT GOT AWAY"!!!!!!!!!!!!!" Continue reading "Artic Grayling Recipe"
While fishing in the depth of the cold waters of Lake Champlain, a fantastic thing occurred. I was down rigging for Lake Trout and hooked a decent fish. Continue reading "Hooked Champ and Lost 'em "
Continue reading "Pecan Encrusted Dolly Varden"
Continue reading "How I one-upped the ol' man"